A rush transcript for "This Week" on September 11, 2016.
camera (Getty Images) Rudy Giuliani, Gen. John Allen, and Sec. Jeh Johnson to appear on "This Week." THIS IS A RUSH TRANSCRIPT FOR 'THIS WEEK' ON September 11, 2016 and it will be updated. ANNOUNCER: Now on THIS WEEK WITH GEORGE STEPHANOPOULOS. DONALD TRUMP (R), PRESIDENTIAL CANDIDATE: We're fighting for every last city and every last person. ANNOUNCER: Ready for battle. With less than 60 days to go, Hillary Clinton under fire for her candid comments. HILLARY CLINTON (D), PRESIDENTIAL CANDIDATE: You could put half of Trump's supporters into what I call the "basket of deplorables." The racist, sexist, homophobic, xenophobic, Islamophobic, you name it. GOV. MIKE PENCE (R-IN), VICE PRESIDENTIAL CANDIDATE: They're not a basket of anything. They are Americans. And they deserve your respect. ANNOUNCER: And Donald Trump taking heat for praising Putin. TRUMP: If he says great things about me, I'm going the say great things about him. CLINTON: He prefers the Russian president to our American president. It is scary. It is dangerous. ANNOUNCER: But with the clock ticking, our brand new poll shows she's held back by questions about honesty. He's struggling to convince voters he's qualified. We talk to each side, former Mayor Rudy Giuliani, and General John Allen. Plus how the tragic 9/11 attacks shaped our country. Homeland Security Secretary Jeh Johnson is here live. GEORGE STEPHANOPOULOS, ABC HOST: Good morning, on this 15th anniversary of 9/11, the deadliest attack ever on American soil. We all remember where we were that traumatic day. And today, we remember and honor the thousands lost that morning, and the thousands more who sacrificed their lives in the wars that followed. STEPHANOPOULOS: That was the moment of silence at 8:46, the time when that first plane hit the North Tower of the World Trade Center. Bells tolling across New York City. Across the country. And the names of the fallen now being read by family members of the victims. Later in the program, we're going to go to the Pentagon, also attacked that day. President Obama will be there to honor the fallen. We're going to bring that to you live. But now we move on to the politics of the moment, and our brand new poll from ABC News and The Washington Post. The top line, Hillary Clinton has a 5-point lead in this four-way race, 46 to 41 over Donald Trump. Gary Johnson, the Libertarian, at 9 percent. And Green Party candidate Jill Stein at 2. That 5-point lead down a bit from her 8-point lead last month. And Clinton now holds a 10-point lead among all registered voters. Holding Trump back, big questions about whether he's ready for the job. Clinton is up by 20 points or more on qualifications, consistency, and temperament. Clinton has the edge on issues too, but that's tight, below single-digit advantage on the economy, terrorism, and immigration. And questions about honesty are helping keep this a relatively close race. A record low 35 percent of voters find her honest and trustworthy. Even fewer, 31 percent, trust Trump. But right now, Trump's backers are more passionate, 48 percent of his voters are very enthusiastic, compared to 36 percent for Clinton. And with that, let's bring in one of Donald Trump's key advisers, Rudy Giuliani. Of course, he was mayor of New York during the 9/11 attacks, and he appeared on THIS WEEK just days after. RUDY GIULIANI (R), THEN-MAYOR OF NEW YORK CITY: We do not want these cowardly terrorists to have us in any way alter our American way of life. This may go on for some time. We have to end terrorism. I believe the United States government is committed to that. And it's going to require us here in America to go about our way of life and not have them imperil it. STEPHANOPOULOS: And Mayor Giuliani joins us right now. Fifteen years later, what's top of mind? GIULIANI: Well, you know, those words are just as true now as they were then. I've been to San Bernardino and I've been to the other places that have been attacked, you know, after that event I happened to have been in London half a block away from the first bomb that went off at a Liverpool station. So I fought through (ph) a number of these since then, and it’s still -- I come away with the following lesson: Resiliency is one of the three or four best defenses against terrorism. And here's the best example of that, something I never believed would happen: twice as many people live in Lower Manhattan today than before September 11th. In the days after September 11th, I was working really hard to get businesses back, maybe even threatening a little. And American Express decided to come back, Merrill Lynch decided to come back. I will always appreciate that because it was like a -- it was like a stepping stone to rebuilding. STEPHANOPOULOS: By most measures, Americans are safer today. Do you agree with that? GIULIANI: I've always thought it was a mixed bag. Not necessarily even today but from the beginning. We're safer in certain ways; we're not as safe in other ways. And here's the problem that we have, and it's almost two (ph) wars. We’re always fighting the last war, and then they figure a new one for us. Terrorists are even more cunning at that. We're always fighting the last battle, the attack of the airplane. So yes, is our airplane safety much greater today? Absolutely. Is our cargo safety much safer today? Can't tell you that. And are we dealing with a different paradigm, meaning there we were dealing with one major group, al Qaeda. Having gone after the mafia and the Colombian drug cartels, I can tell you it's easier to go after a single organization than it is what we're facing today, which is this Islamic nation which we think of just as ISIS in Syria and Iraq, but it has spread its tentacles all over the world. They’re in 28 different countries. Al Qaeda never had the capacity to do that. These are -- I'm not going to say they're smarter people; they're better educated people. And they're people who know us better. They come from France and Germany and England and the United States. The al Qaeda people were Afghan warriors. Great warriors -- horrible people but great warriors. They didn't have the ability to use the Internet; they didn't have the ability to infiltrate. So in some ways we're safer; and in some ways we're in a much more dangerous situation. STEPHANOPOULOS: Of course this is coming right in the middle of the presidential campaign, and Donald Trump and his team have jumped on those comments from Hillary Clinton the other night, where she labeled half of his supporters into a "basket of deplorables," she said. She went on to say this though: she regretted saying the word "half," but then said: "What’s really deplorable is that Donald Trump hired a major advocate for the so-called alt-right movement to run his campaign, that David Duke and other white supremacists see him as a champion of their values. It's deplorable that Trump has built his campaign largely on prejudice and paranoia, giving a national platform to hateful views and voices." GIULIANI: Well, today I'm not going to respond to that. I've never done politics on September 11th even when I was running for president. I actually think the nicest thing, the best thing to say about this campaign is I know Hillary Clinton, I know Donald Trump much better. Neither one of them is a racist. And for either one to say that means they're getting a little too excited in their campaigning, but both of them are good people. STEPHANOPOULOS: How about the issues of national security, though, coming out this week? We've seen that Mr. Trump take some heat for praising Vladimir Putin. Is it appropriate to praise a dictator who represses his own people and violates international law? GIULIANI: Well, see, I don't think he did. And then I think he clarified it the next day. And he sort of clarified during the debate. What he said was -- and I really don't want to talk politics, but let me just explain this. What he said was just because he flatters me doesn't mean he can get a better deal. You've got to know Donald Trump. STEPHANOPOULOS: But he also said if he says nice things about me, I'm going to say nice thing about him. GIULIANI: Well, the same thing Reagan did with Gorbachev. I mean, Reagan and Gorbachev dealt with each other, and it was the Soviet Union then. And Gorbachev was a killer just like Putin is a killer. But that ended the Cold War without firing a shot because Reagan was capable of walking out of Reykjavik. As Trump made clear the other night in Pensacola, he's perfectly of walking out of a deal if it's not in the best interests of the United States. It wouldn't be the first time he walked out of a deal. And generally when -- you know, I've known Donald for 28 years -- when he walks out of a deal, they come back on his terms, just like they did with Reagan and Reykjavik. So I think you have to see that in the context in which it's made. He has the negotiating ability. And then this is all prefaced by a day in which he talked about major increases in our armed forces, going up to 6,000 -- 600,000 troops instead of going down to 420,000. Going up to 350 battleships instead of the lowest since the First World War. Increasing our Air Force, modernizing our nuclear fleet. So he’ll be negotiating with Putin the way Reagan did, from a position of strength, rather than the president, who's negotiating with him -- to the extent that he does, they did over Syria, from a position of weakness. You know, running away from 12 red lines that he drew in the sand. Giving up the defense of Poland and the Czech Republic. Resetting the relationship with Russia. STEPHANOPOULOS: So to those intelligence officials who say that Putin is playing Donald Trump, your response? GIULIANI: I say he has played Hillary Clinton and Barack Obama all over the world. I mean, before they came into office, Putin was sitting there in Russia. Now he's -- now he's in Ukraine under Obama and Clinton. Now he's in Syria, brought in by Obama. Obama's the one who empowered him, not -- not Donald Trump. Donald Trump wants to negotiate with him and push him back into a position in which we can deal with him effectively. STEPHANOPOULOS: You also mentioned the strength of ISIS in Iraq and Syria. GIULIANI: I really don't want to do this today. You're making me do it! STEPHANOPOULOS: Well, just one more question on this because it is -- it is critical and these are critical issues. GIULIANI: They are, and they emerged from September 11th. STEPHANOPOULOS: They do emerge from September 11th. And one of the things that Donald Trump also said on Thursday night, again, is that we should've taken the oil of Iraq. Even if you could do that practically, and most experts say you couldn't, wouldn't that just be theft? STEPHANOPOULOS: But he said leave a force back there and take it, though. GIULIANI: Of course it’s legal. It’s a war. GIULIANI: Until the war is over, anything’s legal. That oil becomes a very critical issue. First of all, if that oil wasn’t there, we wouldn’t have the Islamic State. STEPHANOPOULOS: He says we should’ve taken it. GIULIANI: He should we take it for ourselves necessarily, that we should secure it so it doesn’t get taken by terrorist forces and then we can have some say, some control over the distribution of it. One of the major problems is between the Kurds and the Sunnis and the Shiites is the oil. And the distribution of it. Now if we’re going to have lost that many people in Iraq, we should have something to say about how that oil is distributed. That would’ve been the reason I would’ve done it. Maybe I wouldn’t have anticipated, but it certainly would’ve been good if this had been done. If we had secured that oil, we would not be dealing with ISIS today. They wouldn’t exist. STEPHANOPOULOS: Finally, before we go, I just want to ask you about a front page story in "The New York Times" yesterday. They quoted several of your former advisors saying they’re worried about your legacy because of your support for Donald Trump. GIULIANI: So, you know what I tell them? I’m going to see them all tonight; I get together with all the people that almost died with me on September 11. We were in a building together, we were missing for 20 minutes and Governor Pataki was really shocked when I called him. He said we thought you were missing. The governor and I formed a great bond over that, by the way. So we all get together tonight. I’m sure some of them will be there who anonymously leaked the story, as you remember anonymous leaks from your days back in the White House, they always happen. And I’ll just say to them, worry about my legacy after I’m dead. Right now I’m fighting for my point of view and what I believe. And everybody has the right to their -- I’m fighting for my country. I believe there’d be a major difference between the two of them in terms of our economy and most importantly, how we deal with terrorism. I don’t like the way this administration has dealt with terrorism. I think they’ve put us too much on defense and there have been too many terrorist attacks in the last year. San Bernardino happened less than a year ago. You just start counting them from San Bernardino on in December of last year and we’re talking about a major escalation in terrorist attacks and a major proliferation in terrorist attacks, that this administration I believe has encouraged by going on defense. We’re sitting back waiting for the next attack. We should be on offense. When Hillary said I’m not going to put any troops in, you might as well -- you might as well stop trying to deal with them. I mean, now they know -- now they know you’re a patsy. STEPHANOPOULOS: And we're joined now by retired four-star general John Allen. He's a Hillary Clinton supporter. Gen. Allen, thank you for joining us this morning. I want to get your response to some of the things Mayor Giuliani talked about. But let's begin with this 15th anniversary of 9/11. Your final years in public service and the military really track the evolution of this threat over the last 15 years. GEN. JOHN ALLEN (RET. ), U.S. MARINES: It did, George. Again, thank you for how ABC acknowledged this day and the respectful manner in which it paid tribute to the families and all of those who suffered as a result of this attack. And I also want to say how much all of us remember and respect Mayor Giuliani and the example that he set for all of us at one of the darkest moments in American history. I have -- my career did, in fact, track much of this. On the fifth anniversary, I was on an advanced party in the al-Anbar province, getting ready for my own 13-month deployment on the 10th anniversary. I was commanding the war effort in Afghanistan. And, today, I'm with you. But in the 15th year, I was the president's special envoy to the global coalition to counter ISIL. Three different conflicts, 15 years, three different enemies. And it's been a long time, George. STEPHANOPOULOS: You just heard Mayor Giuliani right there say that ISIL -- he said ISIS -- would not exist had we followed Donald Trump's advice and simply taken the oil, which he said would have been legal. ALLEN: Well, the two are completely separate. The issue of oil and the existence of ISIL or, as the Arabs call them, Daesh, there is only the remotest relationship between the two. So let me just tell you that what we face in the context of the global terrorist movement is a long-term problem associated with social, economic and political issues across that region and the world which has created such a widespread radicalization that one group after another has sprung up over the years. It's not about the oil in Iraq and it's not about the oil in Syria. With respect to taking the oil, I seem to remember that the term, "to the victor goes the spoils," in the justification. You know, we, as a community of civilized nations, stopped saying that and stopped doing that years ago. We may have been able to help Iran in the process of recovering -- excuse me, Iraq -- in recovering its oil enterprise and, in fact, we're doing that today, in helping them with the Baiji oil refinery and others. But the presence of Iraqi oil has had very little to do with the emergence of ISIL. Now ISIL did, in fact, exploit the oil enterprise. But it did so largely in Syria and very little Iraq, if at all. And so the two largely are separate and unrelated. STEPHANOPOULOS: Mayor Giuliani also mentioned what Hillary Clinton said at that forum the other night regarding ground troops in Iraq. Let's listen. CLINTON: We are not putting ground troops into Iraq ever again. And we're not putting ground troops into Syria. We're going to defeat ISIS without committing American ground troops. STEPHANOPOULOS: As you know, we do have troops on the ground in Iraq and even in Syria right now. Setting that aside, is it wise for a potential commander in chief to make blanket statements like that? ALLEN: Well, I think, George, we need to make sure that we're clear on what she's implying. And I think what she's implying -- and I -- she and I have not spoken about this. But as I read it in her comments, she's implying that she's not intending to have the United States be committed into another large ground war in that part of the world. You're exactly correct. There are a large number, over several thousand American and coalition partners, that are on the ground today. And knowing her, as the potential and, hopefully, commander in chief, I know that she'll consult with her leadership and the commanders and will give them the resources necessary to be successful. We have chosen -- and she has reiterated this -- we have chosen that we intend to defeat Daesh, ISIL, through the use of indigenous forces, Iraqis on the one side and the indigenous forces in Syria on the other. That's the route to permanent defeat. And that's something that she has reiterated and I believe that she'll give the commanders what they need to be successful. STEPHANOPOULOS: At that forum the other night, Donald Trump also mentioned generals like you who served under President Obama. Here's what he said. TRUMP: I think under the leadership of Barack Obama and Hillary Clinton, the generals have been reduced to rubble. They have been reduced to a point where it's embarrassing for our country. STEPHANOPOULOS: What did you think when you heard those comments? ALLEN: Once again, I couldn't -- I just shake my head. I don't feel much like rubble. I had the opportunity to participate in a full career for several commanders in chief. 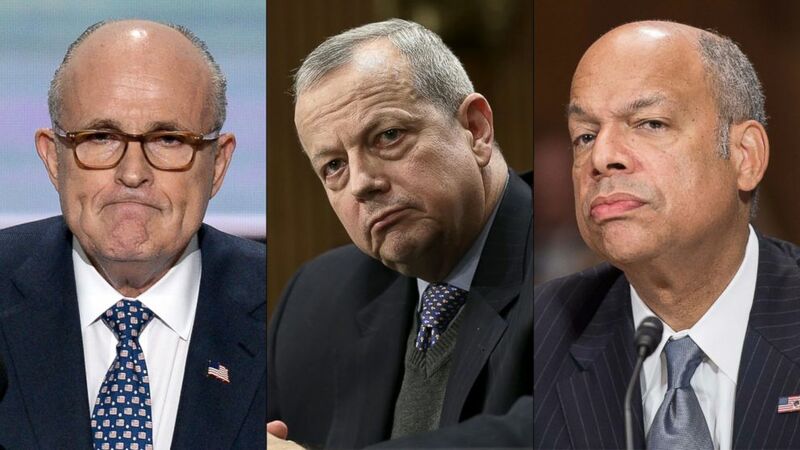 As I look around at my peers -- and I won't go -- start naming names because I would spend the rest of your show doing it -- for some of the finest leaders that America has ever put under stars, whether they're admirals or generals, they're spectacular leaders. And they have not been reduced to rubble. In fact, they are some of the finest both leaders and national security specialists and authorities that this country has minted in a generation. And I was proud to serve with them. And I'm proud to have them in their leadership positions in the world today. They haven't been reduced to rubble, George. STEPHANOPOULOS: And he also says that he was -- he will ask the generals if he, indeed, is elected President of the United States to come up with a plan to defeat ISIS. If he were to do that, would he get the plan we have today or something dramatically different? ALLEN: It's hard to say what the -- what the commander in chief would do when he calls in his key advisers; would be to offer them his guidance, as is appropriate, as the commander in chief, for how he sees the conflict. Of course, he would ask for their advice. But he would offer them their guidance and then would give them some period of time to come back with their best advice, best military advice. And this is key. This is why we have such fine leaders today and the critical role that they play, they provide the commander in chief their best military advice. So my guess would be, if he tasked General Dunford and the military leadership to come back to him within 30 days, they would get from them -- he would get from them their best military advice. STEPHANOPOULOS: General Allen, thanks for joining us today. ALLEN: Good to be with you, George, and thank you again for what you did for the legacy of this terrible day. There's lots more ahead on THIS WEEK. Our powerhouse roundtable is standing by to weigh in on where things stand in the sunset on election. And up next, the homeland security secretary, Jeh Johnson, from ground zero on this 15th anniversary of 9/11 -- are we safer now than we were then? And we're going to get his latest thoughts on Russia's move to meddle in our elections. TRUMP: We have a big debate coming up. Who knows what's going to happen to them? I -- I don't imagine any of you are going to be watching the debate. CLINTON: Donald Trump is a self-proclaimed great debater who won every one of the Republican debates. So I take nothing for granted. STEPHANOPOULOS: That first big presidential debate just two weeks from tomorrow. And our partners at SSRS found this week that 74 percent of Americans are likely to watch that first face-off. But even more voters, 77 percent, said that the debate performances will have little or no impact on how they vote. Here's the number that may matter most -- those 23 percent who say that how the candidates do will have a major impact on their vote. With the audience expected to be the largest in history, that key group could swing a close race. And of all the issues out there, viewers want to hear the most about economy and immigration. We'll be right back with our roundtable and Jeh Johnson. STEPHANOPOULOS: That is the scene this morning in Shanksville, Pennsylvania -- people gathering to remember the victims of United Flight 93, brought down by heroic passengers on 9/11 to prevent an attack on the U.S. Capitol. It is one of many observances today on this 15th anniversary of the attacks. And we are joined now from Ground Zero by the Homeland Security secretary, Jeh Johnson. Mr. Johnson, thank you for joining us this morning. You know, on anniversaries like this, we’re always so concerned about possible follow-on attacks. Are you picking up any intelligence on an imminent threat? JEH JOHNSON, SECRETARY OF HOMELAND SECURITY: George, there’s no specific credible intelligence around the programs that are going on today indicating any type of terrorist plot directed at these programs today. The point, however, is that in the current environment, where we have to deal with the prospect of a lone wolf actor or a self-radicalized actor, just saying there’s no specific credible threat doesn’t tell the whole story. And that’s why you see a lot of security out here today in New York City and in other places where we’re observing 9/11. STEPHANOPOULOS: And that gets to my next question, the big question on a day like this -- are we any safer than we were 15 years ago? I had -- I was speaking to the former mayor of New York, Rudy Giuliani, earlier. He talked about a mixed bag -- safer in some ways, not safer in others. JOHNSON: George, we are safer when it comes to protecting against another 9/11-style terrorist-directed attack from overseas. Our intelligence community, our law enforcement, has become pretty good at connecting the dots when it comes to another overseas-based terrorist-directed plot on our homeland. We’re in a new environment, however, where we have to be prepared against and try to prevent lone wolf-style attacks, the self-radicalized actor. ISIL, AQ, now have the ability to literally reach into our homeland through social media, through the Internet, to recruit and inspire. It makes for a more complicated homeland security environment. And so it requires a whole of government approach, not just military and law enforcement, homeland security, aviation security, and the like. That’s the new environment we’re in, George. STEPHANOPOULOS: We’ve also heard from Donald Trump. He believes that one of the ways to lower the threat is to stop processing visas from countries with a history of exporting terrorism and to add a new layer of screening that he calls extreme vetting. Let’s listen. TRUMP: We should only admit into this country those who share our values and respect our people. In the cold war, we had an ideological screening test. The time is overdue to develop a new screening test for the threats we face today. STEPHANOPOULOS: What’s your response to that? JOHNSON: George, we actually have a pretty intense form of vetting for refugees, immigrants coming from particular parts of the world who meet certain parameters. For example, our Syrian refugee program. The president wanted us to admit this year 10,000 Syrian refugees. These are people -- men, women, children -- fleeing violence and terrorism in Syria. And over the last year, we’ve added a whole bunch of security checks and precautions in vetting refugees. It requires some 18 to 24 months for each individual. And so we have in place now a lot of security around vetting process. We always evaluate whether more is necessary given the current threat environment, but our vetting, when it comes to refugees, for example, is multi-layered and it’s pretty thorough. STEPHANOPOULOS: And what about that ideological test Mr. Trump is talking about? JOHNSON: Well, we -- we always look for indications -- and we’ve enhanced our ability to look at this from -- in social media. We always look for indications of a radical, violent bent. There were some lessons learned recently, where we believe we need to ramp up our looking at social media. We always look for indications of an extremist, violent nature, and that's what we do. And we're getting better at it every day and we're going to keep working at it. Ideology in and of itself, however, you've got to -- you've got to define that a little better. We're determined to root out violent extremism and that's what we look for. STEPHANOPOULOS: Our homeland is also facing new cyber threats, including from Russia. I wanted to ask you about that, because there's a rising chorus in Congress saying that the administration should publicly blame Russia for hacking the DNC email system, hold them accountable for trying to influence our elections. Here's Senator Ben Sasse, a Nebraska Republican. He says that: "If the Obama administration has a reason for not clearly attributing hacks to Russia, it contradicts their own cyber strategy. If they're silent because it would invite response, that suggests we're operating from a position of weakness." They believe that, you know, failing to call out Russia now is going to invite future attacks. JOHNSON: Well, George, there's still an investigation around the DNC hacks. The message I've been sending to state and local election officials is that there's a range of cyber actors out there that are pretty sophisticated right now, not just nation-state but criminal actors, hacktivists, and we have to do our best to protect, in cyber security, our election systems, our election process. And DHS, my department, is in a position to provide assistance if they ask for it. We're having that conversation with state and local officials right now. We can do vulnerability assessments. But the question of attribution is a complicated one and the investigation into the DNC hack is ongoing. STEPHANOPOULOS: But aren't we in danger of having a foreign power influence or alter our vote? JOHNSON: We're concerned about the potential for someone to try to penetrate our elections systems to the extent they are online, on the Internet. Obviously we're very concerned about what happened with the DNC. And it would be very hard to actually alter a ballot count, because our election process is so decentralized. There's some 9,000 jurisdictions, state and local, that are involved in the election process. National, state, and local elections. But we are concerned, to the extent elections system have a presence online, that that be secure. And so we're actively out there now telling state and local officials what the Department of Homeland Security can do to help them better secure their cyber security. STEPHANOPOULOS: Secretary Johnson, thanks for joining us this morning. STEPHANOPOULOS: And up next, we go live to President Obama at the Pentagon on this 15th anniversary of 9/11. Plus, our powerhouse "Roundtable" on one more tumultuous week in politics. STEPHANOPOULOS: There is President Obama at the Pentagon this morning, laying a wreath to honor those who fell on 9/11, when American Airlines Flight 77 crashed into the building's western wall. There has been a moment of silence. And there we see the secretary of defense, Ash Carter. ASH CARTER, SECRETARY OF DEFENSE: Mr. President, Chairman Dunford, honored guests, family and friends of those we lost on 9/11, today, we come together as we have ever year since 2001, we come together to remember those we lost that day and to stand again with their friends and families to honor those we'll never forget. We come together to reflect on all we've done together to recover and rebuild, to respond and to retaliate. And we come together to recommit to our hard but certain mission to protect our country, and our people, and to make a better world for our children. STEPHANOPOULOS: President Obama and the secretary of defense there at the Pentagon this morning to honor those lost on 9/11, one of many ceremonies today. There will be a moment of silence in Shanksville, Pennsylvania, where United Flight 93 went down. And, of course, there has been one at Ground Zero. MIKE BARNICLE, MSNBC HOST: What would you do, if you were elected, about Aleppo? GARY JOHNSON, LIBERTARIAN PRESIDENTIAL NOMINEE: About Aleppo? And what is Aleppo? Believe me, no one is taking this more seriously than me. I had (INAUDIBLE). Well, you know, I was thinking Akron and when he said Aleppo and guilty. It's fair game. I'm running for president of the United States. I respect the process and for those that believe this is a disqualifier, so be it. STEPHANOPOULOS: Gary Johnson, Libertarian candidate, the first big gaffe of the campaign. We're going to get into that on our roundtable. A lot of other politics to get to this morning. Let me introduce our editor of "The Weekly Standard," Bill Kristol; EJ Dionne from "The Washington Post," also the author of "Why the Right Went Wrong;" Republican Congressman Marsha Blackburn of Tennessee; the Democratic mayor of Baltimore, Stephanie Rawlings-Blake; and John Heilemann from Bloomberg Politics. And E.J. Let me begin with our poll this morning, showing that 5 point lead for Hillary Clinton and the 4 point race. Just a bit off her peak in August of an 8 point lead. But not a lot of movement in this race. E.J. DIONNE, "THE WASHINGTON POST": Yes, I think you're seeing a lot of indicators that people, not surprisingly given the clear choice they have got, have made up their minds and it's going to be hard to change their minds. You see a couple of things here. One, where does she have room to grow? I was struck, in the poll, that she's got 79 percent of the people who approve President Obama -- of President Obama. His approval rating is very high in this poll. STEPHANOPOULOS: -- which would be the highest of -- of his -- since the first year as president. STEPHANOPOULOS: And which seems a little bit hard to believe, I've got to tell you. DIONNE: Well, it is higher than the -- than most of the other polls. But whatever, whether it's 58 or 55, he's positive. She's still some room to grow there. It's hard to see where Trump can pick up, but I think the danger to Clinton is in another number in the poll, which shows that the people who are going to Jill Stein or Gary Johnson tend now to be coming from her. And I don't think Trump can win this by building up his vote very high, because I think he's got a ceiling. He's going to push her people off to the third party candidates or to abstention. And that's the last lesson that I take from this poll, which is her -- she needs to motivate her side a little more than she has. STEPHANOPOULOS: Yes, I think -- I think that's right. One of the things we're seeing, Congresswoman Blackburn, though, is those rock hard supporters -- maybe E.J. is right about Donald Trump's ceiling. But the people who are with him right now much more excited about him than Hillary Clinton's supporters are about her. REP. MARSHA BLACKBURN (R), TENNESSEE: That's exactly right. The enthusiasm is on the Trump side in this. And Clinton supporters are not excited about that race. And I think that enthusiasm gap will come into play with this. And, also, is when you probably will see some erosion to Stein and to Johnson from the Clinton camp. There's another thing I think that's significant is looking at what is happening on the ground in the states with the state games, with the ground games that are there, because basically, when you look at polling, you have to go look at the state polling to see what is happening. I was in New Hampshire yesterday and Trump is doing very well there. And there is a lot of enthusiasm in that ground game. STEPHANOPOULOS: There actually is a new poll out this morning, the Marist Poll in New Hampshire, showing it a 1 point race. STEPHANOPOULOS: Mayor, what do you think about that, the enthusiasm gap right now and how does Hillary Clinton prevent that bleeding off over to Gary Johnson and Jill Stein? MAYOR STEPHANIE RAWLINGS-BLAKE (D), BALTIMORE: I think that Trump supporters overstate the enthusiasm gap. I know there are Democrats all over this country that are thrilled about the prospect of having Secretary Clinton as our next president. And I -- and to the contrary, I meet so many Republicans that are so absolutely ashamed of the behavior of Donald Trump during this race. I had a conversation yesterday with a veteran with a brand new, you know, a -- a two-year-old daughter, who said there's no way that he could raise his daughter in a -- in a world where Donald Trump is the president. It's just not aligned with his priorities. STEPHANOPOULOS: -- about Donald Trump. But one of the things you see in this polling, he is consolidating that Republican vote. KRISTOL: -- speaking for two or three weeks here that it's -- people are over estimating how certain it is that Hillary Clinton will win. Now, the big problem he has is in the ABC/"Washington Post" Poll. And this has been very steady for a year -- is he qualified to be president? It's a very sample question. Thirty-six percent yes, 60 percent no. You know, that -- if 36 percent of the public thinks you're -- only 36 percent think you're qualified to be president, you have a problem. On the other hand, people want change. That's the thing that strikes me the most. I mean what will she change? I mean I think Trump should actually put up an ad saying you want change, I'm going to change things, I'm going to build a wall, I'm going to renegotiate trade deals, I'm going to build the military, whatever. What is Hillary Clinton going to change about the past we're on? JOHN HEILEMANN, BLOOMBERG POLITICS: Yes. STEPHANOPOULOS: -- a little more personal, trying to put out a little more policy. HEILEMANN: Look, they are -- there's a consensus among the two campaigns right now. She is ahead. The race is tightening. He has a very, very narrow path to 270 electoral votes. She has a lot of different paths. But they are ahead in Clinton in Brooklyn, but they're looking over their shoulder a little bit at -- at -- at Trump right now. And I think some of those things you're talking about, George, reflect that. They keep hearing that it's not enough to just disqualify Donald Trump. And so they understand that there's got to be some degree of -- of both a personal appeal and also some kind of a positive message. STEPHANOPOULOS: -- E.J. I don't think she meant to -- she wanted to put half of Trump's supporters into that basket of deplorables the other night, which is why she put out this statement saying she regretted using the word "half." But it was a really sorry -- a real sorry, not sorry statement, even as she said she regretted using that word, "half," she doubled down on what she's been saying about Donald Trump. DIONNE: Well, first, any presidential candidate going into a fundraiser should write on their hand, "I am a candidate, not a political analyst." DIONNE: It always gets you into trouble. On the other hand, your point is well taken. She quickly pivoted off that. She realized, hope, I shouldn't have said it that way. But she moved it where there is a case to be made, which is this is a very extreme campaign. This is -- you know, the campaign chief is from Breitbart. There is -- the alt-right is important here. That's the difference with the 47 percent, I think. Romney couldn't really go anywhere from that that was constructive. She's trying to move this way. But she still should not have said it and she knows it. BLACKBURN: You know, I've got to tell you, Hillary's 50 percent comment, it is resonating. People heard what she said. And I've got to tell you, when you look at things like corruption, the Clinton Foundation, her comments about she wouldn't put ground troops in, that is what causes people some concern. And then they say and you think half the country, 50 percent of the country fits a basket of deplorables, irredeemable, not America? RAWLINGS-BLAKE: -- when she insults people, she apologizes for it. BLACKBURN: She did not apologize. BLACKBURN: She gave a half-hearted, well, I'm sorry I got caught. RAWLINGS-BLAKE: -- it's a Republican. UNIDENTIFIED MALE: -- she said half of the Trump supporters. KRISTOL: That's actually a problem that she -- she said half the Trump supporters are these irredeemable deplorables. The other half, though, are these kind of pitiable Americans who are suffering, who are very anxious about their future. KRISTOL: -- instead of trying to win people over. STEPHANOPOULOS: Is this comment going to matter a month from now? RAWLINGS-BLAKE: He never does anything wrong. HEILEMANN: Comparatively speaking, her apology was relatively clean. I do think it's -- it violates the kind of fundamental campaign tenet, which is it's fine to attack your opponent, but you should really stay away from attacking the electorate. HEILEMANN: -- is that Donald Trump has attacked her as a bigot over and over again, right? And there's no real -- there was never before this moment, there was never a time in which you could -- you could kind of justify that, where she had said anything that actually kind of met the dictionary definition of bigoted. But this comment kind of gets very close to the dictionary definition of bigoted, so it gives Trump a talking point that he will go back to again and again. DIONNE: Could I say the real cost of this is, if she hadn't said that, we might now be talking about Donald Trump's love affair with Vladimir Putin or a million other subjects today. That's where the news was going and all the dissent in Bill's party over what he's saying about Putin. And, instead, we're talking about this. KRISTOL: Each of these candidates does a good job every week of trying to lose this campaign. BLACKBURN: -- raising $6 million. This is what -- this is what is in her heart of hearts, this is what she thinks about people that are out there in fly-over country, if you will. And that is why these 50 state polls are so important. RAWLINGS-BLAKE: When you talk about what's in your heart of hearts, you have to look, to your point, about someone who is praising and idolizing Putin. We're here, having a very lively political debate. That doesn't happen in Russia. STEPHANOPOULOS: And, Bill Kristol, that did put Republican leadership one more time in kind of a difficult spot. You saw Speaker Ryan saying I'm not going to comment on the campaign; Marco Rubio saying he disagrees; other Senate candidates put in difficult positions as well. But Donald Trump not backing down at all on that phrase. KRISTOL: No, that's amazing. And it's pretty disqualifying for me. But a lot of other people are -- I mean, the most depressing thing for me as a conservative and a Republican for all these years is seeing other conservatives and Republicans moving over now. They feel they have to defend Trump. So suddenly they have to sort of defend his comments on Putin. And suddenly they're rationalizing, defending an anti-American dictator. If the Republican Party has stood for anything over the last quarter century, it's that we are pretty tough in opposing anti-American dictators. RAWLINGS-BLAKE: And painful to watch respectable Republicans have to defend him. KRISTOL: But why does he have to, though? STEPHANOPOULOS: I don't think he was pained by that at all. KRISTOL: You're being nice to a fellow mayor. You mayors all stick together. STEPHANOPOULOS: You know, but speaking about Russia, E.J., you know, you keep hearing, oh, they've got the 30,000 e-mails that were deleted from Hillary Clinton's server. There's more to come in this election. Jeh Johnson would not come down definitively and say that Russia was behind that hack. But most intelligence officials believe they were. DIONNE: Yes, this is a very scary thing. We -- and also with the electronic voting in the number of states that don't even have a paper ballot as a backup, this is a very scary thing. And the one thing that Trump, I think -- I mean, I think substantively, it's a horrible thing that he's doing with Putin. But politically, it's also harmful because now the Democrats have an argument that if something comes out of Russia to discredit her, this becomes a story about why are the Russians, why is Putin trying to interfere in our election, which is a conversation she would very much like to have. RAWLINGS-BLAKE: But what about The Trump Foundation and illegal campaign donations? There's a difference between allegations and evidence. BLACKBURN: Well, let me tell you, well, there's a lot of documents and lot of evidence on wrongdoing of The Clinton Foundation. BLACKBURN: -- it is coming out. STEPHANOPOULOS: -- and I want to talk about that for a minute because we did see this forum on Thursday night, the candidates back-to-back, lots of attention right there, strong ratings. What did you take away from that looking ahead to the debates? HEILEMANN: Well, I think that there's a -- that -- to the extent that the -- in the moment, it seemed as though Trump had a better night than Hillary Clinton in terms of style and the immediate aftermath. But then as people started to focus on the substance, particularly on the issues around Putin, his comments about the general, the Clinton campaign was able to get that conversation back where it wanted to be. And I do think that the -- what we're going to see is a different kind of environment on that debate stage, right, where the two of them, side by side, where Trump is pressed to engage in a sustained -- as much as you can in any relatively so short timeframe -- a sustained set of arguments that are going to be, I think, more driven by policy and substance. She's got to worry about his ability to bluster his way through anything. And obviously, the stakes are going to be really high for both of them. But I do think to the extent that the thing becomes a matter of substance and he is in a one-on-one environment -- he's never been like that before; she has been in many one-on-one debates before -- she's going to have a strong advantage coming into those debates for that reason. STEPHANOPOULOS: How aggressive should she be? DIONNE: It's very tricky for her. I think she needs to be aggressive enough to challenge Trump, particularly when he says things that aren't true. But she's also selling herself. And this goes to Bill's point. She needs to give voters a comfortable place to go to oppose Trump. So she's got a tricky path. What was fascinating in the wake of this debate and the critique of Matt Lauer from Democrats, we have spent about 40 years hearing conservatives do an excellent job trashing the media and saying the media is biased toward liberals and Democrats. STEPHANOPOULOS: And the Clinton camp, they sort of said it was not a great night but might be good for them in the long run. Do you agree with that? KRISTOL: Well, because they can spin the notion that Matt Lauer is the right-winger whose brutally tough questioning of Hillary Clinton was unfair; I think that showed the weak -- I mean, when you have a weak candidate, you blame the media. Believe me, I'm Republican. KRISTOL: -- and we lost those elections, right? And I think the fact that the Left went to blame the media after that does show what John says, that in that -- Trump doesn't know anything about foreign policy. What he says in many cases I really think is abhorrent. But he -- in the evening, he looked more presidential than she did. BLACKBURN: But Hillary can't remember what she does and does not know about foreign policy and if she got briefings or not. And then she has great clarity on, you know, what a C -- what would be confidential or the header but couldn't remember if C was for a paragraph. RAWLINGS-BLAKE: -- that knows better than anyone in the world how to cure the ISIS problem. He knows better than any general how to cure the issue of terrorism. RAWLINGS-BLAKE: Which one is it? RAWLINGS-BLAKE: And he wouldn't predetermine that he's not going to put troops in. And national security is the number one issue. STEPHANOPOULOS: And that is going to have to be the last word today. Thank you all very much. STEPHANOPOULOS: Right back after this from our ABC stations. STEPHANOPOULOS: And that is all for us today. Thanks for sharing part of your Sunday with us, this 15th anniversary of 9/11. I'll see you tomorrow on "GMA."